Exchangepedia | Is GoGo’s use of a fake SSL certificate a Man-In-The-Middle attack? Adrienne Porter Felt, an engineer on Google’s Chrome security team, recently found in-flight WiFi service provider GoGo using a fake certificate for Google.com and tweeted the following, with a screenshot. If you’re a GoGo customer, here’s why you should be concerned. 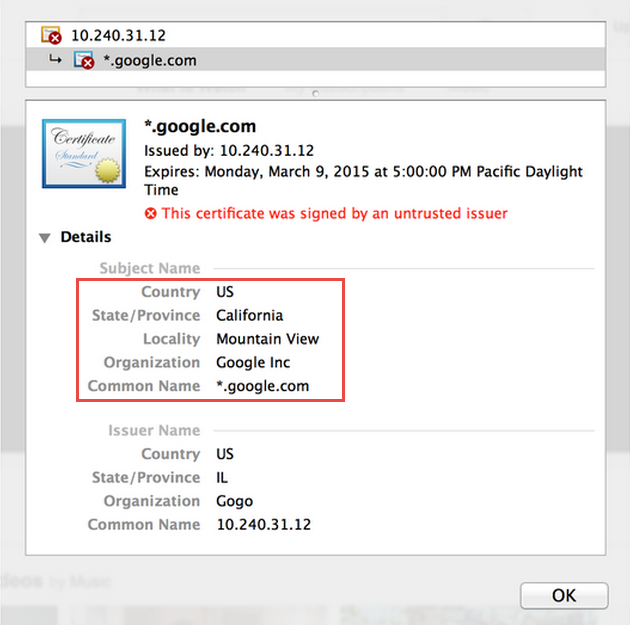 GoGo used a fake wildcard certificate – a certificate issued for all Google domains (*.google.com). This gives them the ability to intercept/decrypt all SSL-encrypted traffic to Google services. Is it really a Man-In-The-Middle attack? 1. It’s GoGo’s network and they’re authorized to do whatever they want on their own network. 2. It’s a common practice – many corporate networks intercept and decrypt their users’ encrypted traffic. 3. It’s a valid method for detecting and blocking streaming video and thereby preventing misuse of their network. This is also the reasoning GoGo uses in its response. 4. Web browsers do warn you about the certificate (as Chrome did in this case). 5. If you don’t like it, don’t use it. What’s a man-in-the-middle attack? Quite simply, it’s when a third entity inserts itself between you and the person or service you’re communicating with, and is able to intercept, monitor, capture or control the communication by impersonating as one of the parties. Google described an attempted man-in-the-middle attack a few years ago when fraudulent certificates for Google.com issued by certification authority DigiNotar were used. GoGo uses self-signed certificates. Web browsers warn against certificates not issued by a trusted certification authority, but the warning is generally ignored by most users. Is GoGo using a fake SSL certificate and impersonating a third party (Google)? Is GoGo decrypting encrypted communication between its customers and Google? Is Gogo monitoring, inspecting or capturing the decrypted communication? Sure, it’s GoGo’s own network, but unlike businesses that provide network access to their employees, who are subject to their accepted corporate policies, GoGo is a paid service provider. Intercepting encrypted traffic is not something one expects from a service provider. You could give GoGo benefit of the doubt and assume there was no malicious intent and that GoGo isn’t inspecting or capturing your personal data including passwords. But decryption of encrypted traffic between two entities by a third party without their explicit consent or knowledge is unethical and should be illegal. Regardless of whether GoGo saves the decrypted communication or not, or whether it uses the decrypted data for a malicious purpose or not, GoGo’s behavior meets the definition of a MITM attack. Of course it is (a man-in-the-middle attack). It is the very definition of how a man-in-the-middle attack works. If I were to explain it to students, I could easily use this as an example. It’s a bit strong to call it a MitM attack, although I guess you could. But MitM attacks are also about intent, and their intent wasn’t purely malicious. …we don’t support various streaming video sites and utilize several techniques to limit/block video streaming. One of the recent off-the-shelf solutions that we use proxies secure video traffic to block it. Interestingly, Chari makes no mention of the fake certificates. 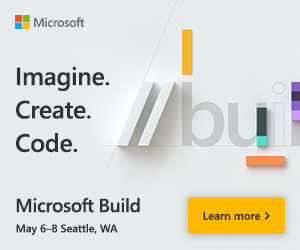 The right thing to do is to not use fake certificates to inspect its customers’ traffic. But if GoGo insists on taking that route, the least it can do is clearly indicate that it will be inspecting customer traffic to some/all destinations to ensure some users are not hogging bandwidth. This includes decryption of SSL-encrypted traffic between a GoGo user and the site or service they’re communicating with. The info should be clearly displayed when a new user signs up for GoGo service and every time users log-in to the service. If GoGo insists on taking that route, the least it can do is clearly indicate that it will be inspecting customer traffic. Until GoGo fixes it or gives a clear indication, I’ll give in to the last argument and not use their service. If you do use it, a more secure option may be to connect to your company’s VPN or one of the free VPN services. If it looks like a skunk, smells like a skunk….